I used to wear a lot of plaid back in my punk days in the mid 1980s. This red and black dress is a nice modern way to update the look. It looks like a fun dress to go dancing in - alas, I am a terrible dancer. I love the interesting cutout neckline on this black dress - very sweet. I'd wear it to a romantic dinner out. 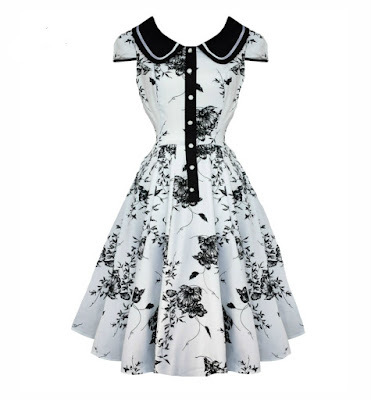 I'd want to try on this black and white floral to be sure it wasn't too big or hideous of a print in person. Otherwise, I think I would love wearing this to a gothic tea party, or an afternoon of shopping and cocktails with the girls. I don't have any balls to go to - this red dress makes me want to orchestrate one just to have a reason to own this! I don't look good in wiggle skirts and don't have an office to wear this to. This would be an amazing wardrobe addition for a busy corporate goth. Here it is in red, too. 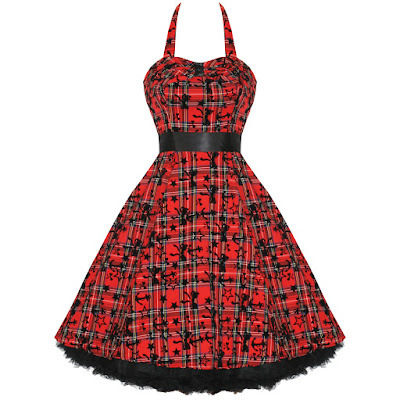 I'm sorely tempted by this halter dress. Halter dresses look good on me, and I can see myself wearing this to park picnics with my friends, dinner and a movie, or the farmer's market on the way back from a bookstore shopping spree. I go boating as often as I can find the opportunity, so I'm negligent for not owning a cute sailor dress before now. I also end up doing fun things along the Seattle waterfront, like taking visiting relatives to the Seattle Great Wheel. I'd love flouncing about the waterfront in this! I can't decide if the print on this fruit dress is intriguing or atrocious! I think I like it. 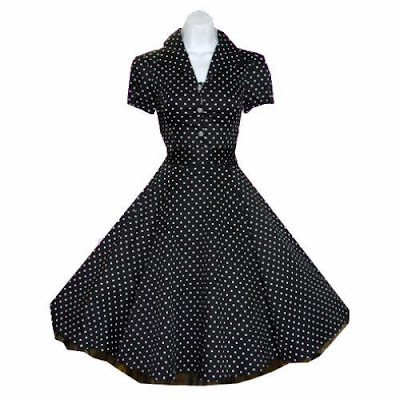 I like the fitted, tailored style of this polka dot dress. Another one that would be good for a professional corporate goth.